April 9 (Wednesday, 5 -8:30 p.m.) Annual Meeting and Dinner. Plan to attend this popular gathering of members and friends to review the year just past and look ahead to the future. 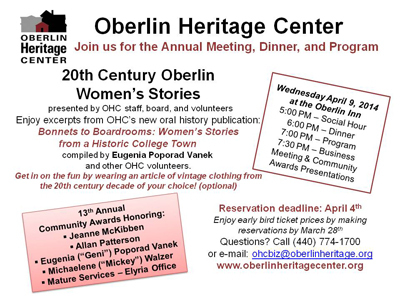 The evening's program features women's stories about 20th century Oberlin collected by the Oberlin Oral History project, the presentation of OHC's 13th Annual Community Awards, and a brief business meeting. Festivities begin with a social hour (optional) at 5 p.m., dinner at 6 p.m. and the program at 7 p.m.
Reservations due April 4. Cost is $33/members and $38/non-members (or $28/members and $33/non-members if reservation made by March 28). Location: Oberlin Inn.